and 124 clubs with an approximate membership of 4260. This project encourages the GFWC Pennsylvania clubwomen in two areas: Member activity through a walking challenge and community service by stressing the GFWC Signature Project "Domestic Violence Awareness". 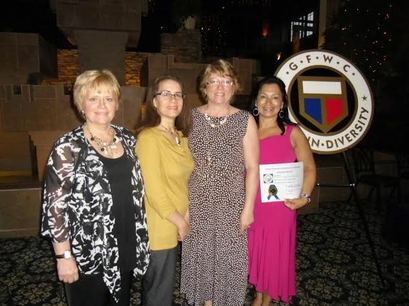 The GFWC Hollidaysburg Area Women's Club is a member of GFWC Pennsylvania, Mid-Atlantic Region, and South Central District of the General Federation of Women's Clubs. The 2019 GFWC PA Convention will be held at the Radisson, Valley Forge May 3-5, 2019. All GFWC Pennsylvania Women's Clubs are invited to meet at the Annual Convention to celebrate the previous club year's achievements. At Convention we celebrate our goals, accomplishments, and interests with fellow clubwomen. While attending Convention we discover the many ways GFWC impacts our State. Our clubwomen look forward to participating in workshops, the arts and crafts fair, and hearing interesting speakers. Attending Convention gives us the opportunity to meet the Officers and District Directors of GFWC Pennsylvania, the GFWC Regional Directors, and seeing many familiar faces from across Pennsylvania. The 2015 GFWC Pennsylvania Summer Leadership Conference - IGNITING THE VOLUNTEER SPIRIT - was held July 17th and 18th at The Penn Stater Hotel & Conference Center, State College, Pennsylvania. GFWC Hollidaysburg Area Women's Club members Alyssa Barilar and Donna Malone presented a workshop: "How to Market Your Club Responsibly on Social Media." The presentation featured a bookmark created specifically for our workshop to promote a new hashtag: #LivingTheVolunteerSpirit. GFWC Pennsylvania clubwomen are encouraged to use the hashtag to unite our clubs and raise awareness of GFWC and GFWC Pennsylvania when posting to their social media accounts. Click on the image to download your own copy of the Social Media Presentation.